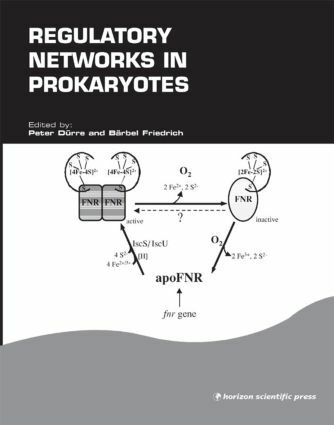 The book describes new regulatory networks, discusses variations of common themes, and provides fresh insight into well-studied mechanisms. Essential reading for all scientists involved in the study of regulation and regulatory networks. 1. Regulatory Networks in Prokaryotes: Variation on a Theme. 2. Regultion of Gas Formation in Halophilic Archaea. 3. Sensory Transduction to the Flagellar Motor of Sinorhizobium meliloti. 4. Regulation of Succinoglycan and Galatoglucan Biosynthesis. 5. Control of Temperature-Responsive Synthesis of the Phytotoxin Coronatine in Pseudomonas syringae by the Unconventional Two-Component System CorPRS. 6. Regulatory Factors of Bordetella pertussis Affecting Virulence Gene Expression. 7. Influence of the leuX-Encoded tRNA5Leu on the Regulation of Gene Expression in Pathogenic Escherichia coli. 8. The ciaR/ciaH Regulatory Network of Streptococcus pneumoniae. 9. Members of the Fur Protein Family Regulate Iron and Zinc Transport in E. coli and Characteristics of the Fur-Regulated FhuF Protein. 10. Towards an Understanding of the Molecular Mechanisms of Stimulus Perception and Signal Transduction by the KdpD/KdpE System of Escherichia coli. 11. Mechanism of Regulation of the Bifunctional Histidine Kinase NtrB in Escherichia coli. 12. Regulation of Nitrogen Fixation in Klebsiella pneumoniae and Azotobacter vinelandii: NifL, Transducing Two Environmental Signals to the nif Transcriptional Activator NifA. 13. Regulation of Nitrogen Fixation in the Phototrophic Purple Bacterium Rhodobacter capsulatus. 14. Oxygen-Regulated Expression of Genes for Pigment Binding Proteins in Rhodobacter capsulatus. 15. The Hydrogen-Sensing Apparatus in Ralstonia eutropha. 16. Control of FNR Function of Escherichia coli by O2 and Reducing Conditions. 17. The Molecular Biology of Formate Metabolism in Enterobacteria. 18. Nitric Oxide Signaling and NO Dependent Transcriptional Control in Bacterial Denitrification by Members of the FNR-CRP Regulator Family. 19. Regulation of Heme Biosynthesis in Non-Phototrophic Bacteria. 20. Transcriptional Regulation of Solventogenesis in Clostridium acetobutylicum. 21. Network Regulation of the Escherichia coli Maltose System. 22. Carbon Catabolite Repression by the Catabolite Control Protein CcpA in Staphylococcus xylosus. 23. CcpA-Independent Carbon Catabolite Repression in Bacillus subtilis. 24. Structure-Function Relationship and Regulation of Two Bacillus subtilis DNA-Binding Proteins, HBsu and AbrB. 25. Regulation of Ribosomal RNA Synthesis in E. coli: Effects of the Global Regulator Guanosine Tetraphosphate (ppGpp). 26. Recent Insights into the General Stress Response Regulatory Network in Escherichia coli.